Friday marked the beginning of in-water construction of a new waterfront conservation area in Peel Region. The Lakeview Waterfront Connection project will transform a degraded section of the shore into a beautiful, naturalized conservation area, expected to become a hotspot for wildlife migration and a green oasis in the heart of the city. Clean rubble is now making its way to the lake via a recently completed construction access route that runs through the lands of the old Lakeview generating station. Together, Credit Valley Conservation, the Region of Peel and Toronto and Region Conservation Authority will build the new conservation area over seven to 10 years. 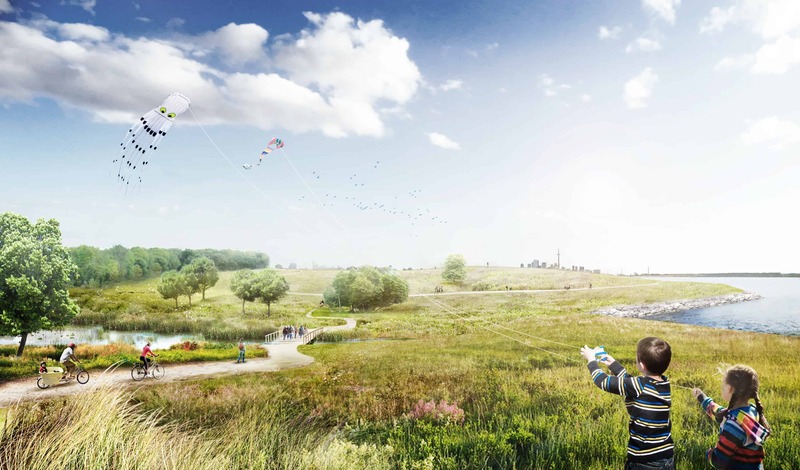 When completed, it will boast roughly 64 acres of new natural habitat including 1.5 kilometres of beach, new meadows, forests, wetlands and rocky islands, stretching from the old Lakeview generating station to the Toronto border at Marie Curtis Park. Over 100 local residents celebrated the start of construction at a kickoff ceremony on September 24. The Lakeview community has been involved in shaping the project form its start through regular public consultation sessions. Currently, this area has some of the lowest numbers and species of fish along the Mississauga waterfront. There is little food, shelter or connected corridors to support the life requirements of plants and animals. The project will enhance fish habitat, via new wetlands, resuscitated creeks and in-lake habitat features that promote spawning. The western Lake Ontario shoreline is a key stopover area for migrating birds, bats and insects. There is currently not enough habitat in this area for migrating birds to nest, rest and refuel for their long flights. The new conservation area will boast 29 acres of meadow and 11 acres of forest that will help support migrating birds. This area is currently not accessible to the public. The Waterfront Trail runs along Lakeshore Road, away from the lake, in this area. The new conservation area will connect people to the lake and bring to Waterfront Trail to the water’s edge. More information on the Lakeview Waterfront Connection Project is available at https://cvc.ca/lakeviewwaterfrontconnection. 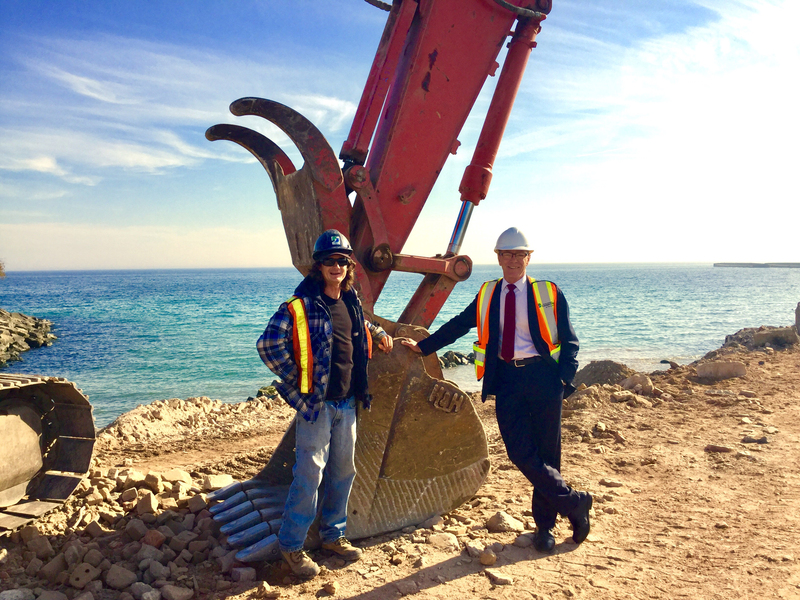 Caption: Councillor Jim Tovey on-site as first load of rubble is placed to construct Peel Region’s new waterfront conservation area. Left to right: Andy Brown, Heavy Equipment Operator; Jim Tovey, Councillor, Mississauga Ward 1. 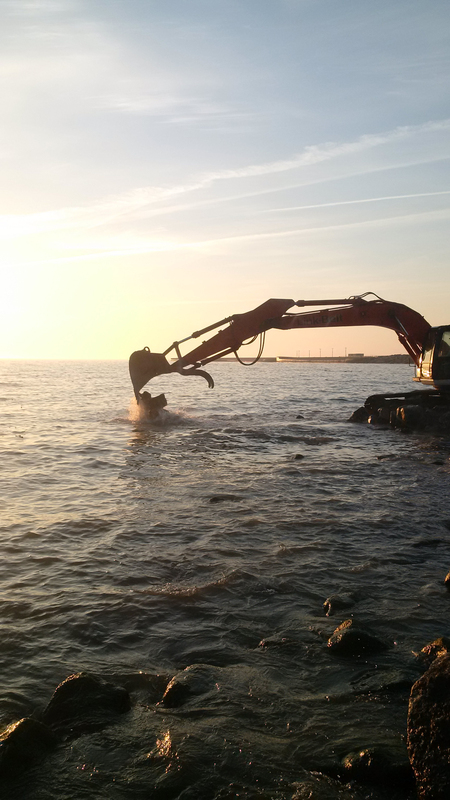 Caption: The first load of rubble is placed to restore the shoreline and create a vibrant new waterfront conservation area. Caption: Artist rendering of the future conservation area – looking east over the mouth of Serson creek. Conservation authorities are a provincial/municipal partnership. For more than 60 years, Credit Valley Conservation has worked with its partners to build a thriving environment that protects, connects and sustains us. Credit Valley Conservation gratefully acknowledges financial support from our member municipalities for facilities, programs and services: the Regions of Peel and Halton; the Cities of Mississauga and Brampton; the Towns of Caledon, Erin, Halton Hills, Mono, Oakville and Orangeville; and the Townships of Amaranth and East Garafraxa. CVC is a member of Conservation Ontario. Building the Jim Tovey Lakeview Conservation Area is a joint effort of Credit Valley Conservation, the Region of Peel and Toronto and Region Conservation Authority. The project is supported by the Cities of Mississauga and Toronto who provide on-going review.